Thank you for posting this Doug. I've known Joe for 32 years and am in shock right now. It was only a few months ago I helped him upgrading his mic preamps in Sam's Tape Truck. Wow, Wayne, that's a long run. I always loved seeing what he was working on, and enjoyed talking to him. I've no idea what happened. I met Joe at Doppler back in 1985 or 1986 when I commissioned Doppler's SSL. 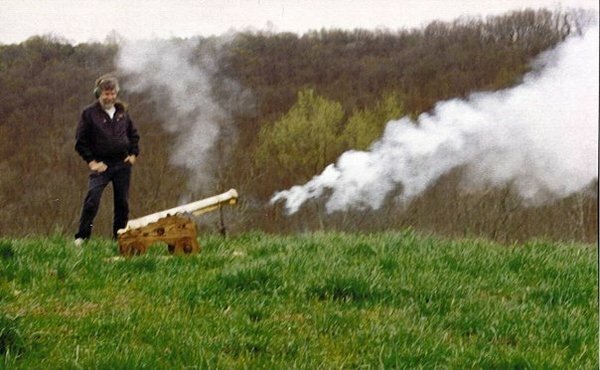 Joe was at that time one of the co-owners, Chief Engineer and Lead Tech. Doppler was a beautiful purpose-built studio and was extremely well laid-out. The back of the big Studio opened up, through a sound lock/landing to an outdoor truck-high loading dock. Load in and out were easy in that room. You'd back in, open two sets of doors, and the inside of the truck became part of the studio. Getting an orchestra in and out was easy. This had obviously been designed by someone that had been a roadie, or in this case, a tape truck operator. Most commissionings I did for SSL were a total PITA because construction was usually still underway and the owners weren't ready and had too aggressive a timeline to open. As a result I would often be asked to arrive one to two weeks early. Work on the console stopped while someone installed a floor underneath or we'd have to cover the console while someone nearby cut drywall. Commissioning was an after thought. Not at Doppler. When I got there Joe had the place ready. Prior to this I had never been able to walk in and go to work. I was amazed at the organization of this man. Joe was probably a pretty good carpenter and woodworker but he hired one of the best to do Doppler's upgrades. Pulling floor troughs open to look at wiring revealed furniture-grade construction everywhere - even under floors! Everything was neat, tidy clean, labeled and properly-grounded. Doppler was one of the easiest commissions I ever did because Joe made it easy. He was organized in everything he did. A few weeks after my time at Doppler I received a very kind letter of recommendation from Joe that was also sent to SSL. He and I spoke occasionally by phone after that - the time was still pre-Internet. Last summer Joe redid Sam's Tape Truck's preamps and we worked together, by phone and email, on that. During that time there was no mention of any illness and we talked about doing a layout for a future product together. Joe gave me some advice on solar panels which caused me to visit his home by satellite imaging. His and his wifes' new home in Ellijay Georgia, north of Atlanta, was beautiful. IIRC Joe told me that he made a deal with his wife to build an art studio for her while he built a huge garage and workshop for Sams' Tape Truck. I'm going to miss Joe. I could always count on Joe for honest and solid technical advice gained from years of field experience. What I will miss most however is a good, honest, hard-working true friend. 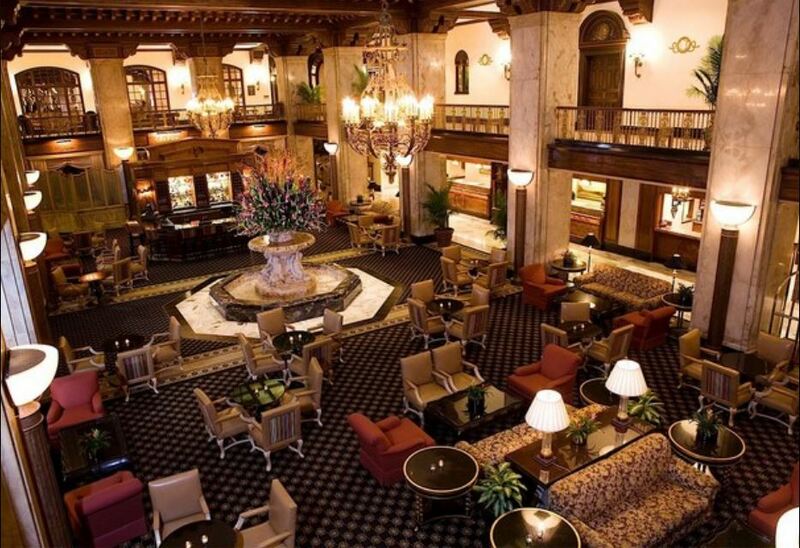 Very nice Wayne. It’s always nice to hear about the person behind the avatar. I always enjoyed reading his posts. This was the first of Joe's builds to get my attention. 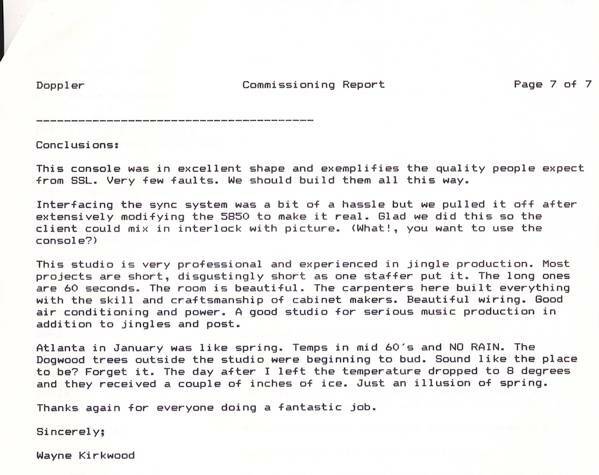 I took a trip down memory lane in the garage this afternoon and found the 7 page SSL Commissioning Report I wrote 29 January 1986 for Doppler Studio's SL4048-32-BG console. It's was serial number 4279. The console was in very good shape and most of the time spent was working out the Sony 5850 Video Machine/BTX/SSL Interfaces necessary for post-production. I show that Bill Quinn was the Chief Engineer at the time with Joe Neil as Chief Maintenance Engineer. I'm not sure when Joe's ownership interest began. I now remember the "disgustingly short" description of project length as being Joe. Pure Joe. Joe's attention to detail and his hospitality - and everyone's hospitality at Doppler- made this one of the easiest and most pleasant commissionings I ever did. 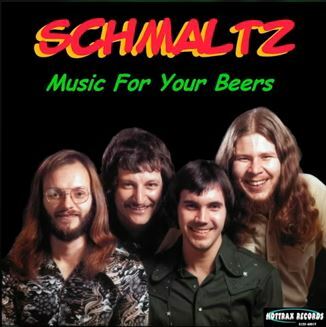 Schmaltz, "The Marijuana Song," from the album "Music for Your Beers." Written by, and vocals by Joe Neil. 1972. Joe is on the far right.